Weeds like blackberries and trumpet creeper and invasive plants like oriental bittersweet, Japanese honeysuckle, and multiflora rose readily invade the Arboretum's forest edges. The vegetation can grow so densely that tree saplings become girdled and bent by vines and native shrubs are overgrown and shaded out. These areas are impassable for people and equipment. Targeted goat grazing uses goats to target the control of particular plant species. The Shared Earth Foundation provided funds starting in 2011 for the Arboretum to try targeted goat grazing on several plots covering approximately two acres. The private company EcoGoats brought in two herds of about 30 goats each for the project. When one of the EcoGoats goats had triplets during the project, EcoGoats agreed to leave one kid behind to help start the Arboretum’s small goat herd. The Arboretum's four goats live beside the South Meadow along Nursery Road, where they have a fenced half acre to roam and a barn for cover. They earn their keep by grazing in thickets around the fields and woods edges, where they are kept in temporary electric fencing. Goats are sure-footed browsing animals with an appetite for a wide variety of plants, including thorny, woody plants that many other animals will not eat. Using goats to repeatedly graze an area will kill most woody plants without using herbicides or mechanical means of control. Goats can also be used to quickly clear away brush for access to pursue other treatment methods, such as cutting vines and mowing brush or herbiciding resprouts of unwanted plants. 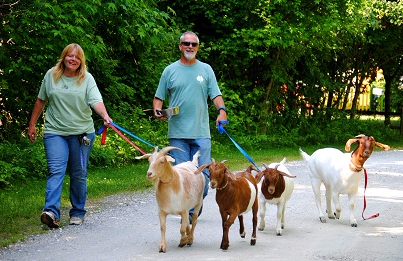 At Adkins Arboretum, goats are used to clear overgrown areas so that staff can access the sites for other treatments. A herd of about 30 goats can clear a half-acre area in about two days. Woody vines are clipped from trees and a brush mower will cut any brush left standing after the goats have finished their brousing. Invasive tree species such as white mulberry (Morus alba) and black locust (Robinia pseudoacacia) are killed and removed. Herbicide can be applied directly to cut stems and to resprouts of undesirable plants with less chance of harming surrounding desirable plants. Researchers monitor changes in the vegetation and soils following the grazing and other treatments to determine how to best use goats for future projects. Once a site has been cleared of weeds and invasive plants, replanting can begin. On these sites, the Arboretum will plant tree saplings and shrubs to establish a healthy forest. A healthy forest is more likely to resist invasion by undesirable plants, although they will always need to be monitored and managed to prevent future encroachment by invasive non-native plants. For more information on targeted goat grazing, call 410.634.2847, ext. 0 or visit the websites listed below.